Dog Training Methods: Which Is The Right One For Your Dog? When choosing a dog trainer it’s important that you understand what they are going to be doing with your dog. Are the methods they use effective? Enjoyable for your dog? or even relevant to the problem? By understanding the following technical terms you can assess what methods your dog trainer is using with your dog. Firstly, we need to understand how dogs learn. There are two types of learning that can be applied to dog training, these are called classical conditioning and operant conditioning. Classical conditioning is when an animal learns an association between two events. In this type of learning, the first event becomes a predictor of the second. Therefore, you can classically condition any stimulus (item, action or noise) to predict a subsequent event. Initially, the item means nothing to the animal on its own. For example when a puppy first sees a food bowl for the very first time. Once the bowl is paired with food on a regular basis the appearance of the bowl begins to predict the food. Classical conditioning is typically used during dog behaviour work to change how a dog feels about a stimulus often by pairing something the dog is fearful of with something the dog likes. In operant conditioning, the dog learns that the performance of certain behaviours leads to particular outcomes i.e. if I do something in response to a stimulus there is a consequence that follows. For example, if I ‘sit’ when requested by the owner Imay receive a treat. In this case, the stimulus is the ‘sit’ cue, the behaviour is the ‘sit’ and the consequence is getting the treat. There are 4 types of operant conditioning often referred to the four quadrants. The four quadrants are positive reinforcement, negative reinforcement, positive punishment and negative punishment. The quadrants are used to teach dogs to either perform or suppress particular behaviours with reinforcement increasing behaviours and punishment reducing others. Positive reinforcement is when you add something good to the environment and a behaviour increases. The item added is something enjoyable that motivates the animal to perform a desired behaviour. For example, adding a treat after your dog performs a ‘sit’ is going to increase the probability that your dog will perform a ‘sit’in the future. The dog is motivated to perform the ‘sit’ as they learn the behaviour leads to a good consequence. However, the item added needs to be something that is of enough interest to the animal that they are willing to perform the behaviour in order to gain access to it. Negative reinforcement is when you remove something unpleasant from the environment and the performance of a behaviour increases. For example, when using a slip lead/choke chain or other device that applies pressure when a dog pulls to increase the behaviour of the dog walking without pulling. Here, the removal of the uncomfortable pressure as the dog stops pulling encourages the behaviour of walking calmly. The dog is, therefore, more likely to walk more calmly in the future. Negative reinforcement generally involves pressure and release with the release from pressure used to increase the desired behaviour. The release of pressure is not a reward but can be thought of instead as a relief from discomfort. When you add something to the environment and the performance of a behaviour reduces this is known as positive punishment. The addition is made after the performance of the behaviour and is usually something aversive (unpleasant) used to suppress the behaviour. An example would be jerking hard on a lead to pull a dog down when the dog jumps up. Finally, negative punishment is when something the dog wants is removed as a form of punishment for a particular behaviour. This could apply when the dog performs the ‘wrong’ behaviour. For example, if a dog performs a ‘down’ instead of a ‘sit’ when asked for the ‘sit’. If you take the treat away when your dog performs the down then this is negative punishment. Negative punishment is successful when a behaviour reduces after the punishment. In this case, if the dog subsequently avoids performing the ‘down’ behaviour when asked for the ‘sit’. There are no magical mystical training techniques in dog training. 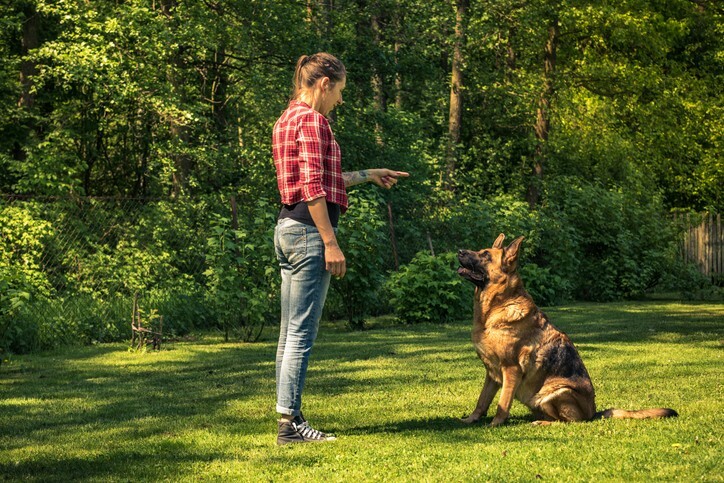 All dog training can be broken down into one or more of these four methods and all of these methods can be used to change your dog’s behaviour. However, research suggests that the use of negative reinforcement and positive punishment creates a degree of anxiety in dogs during training. This may harm the dog-human bond and be detrimental in the long term to resolving any behaviour performed by the dog due to fear or anxiety. Positive punishment can be used very quickly and effectively to suppress behaviours, however, it is worth considering that it does not address the reasons as to why the behaviour is performed in the first place. Additionally, positive punishment may add to emotions of fear or frustration that may be driving the behaviour. This could lead to the behaviour reoccurring to a much greater extent in the future. Therefore, this creates a particular risk if positive punishment is used to suppress aggressive behaviours in dogs. Positive reinforcement, in contrast, creates positive emotions and if used correctly creates dogs that enjoy learning and are motivated to train rather than those who are just looking to avoid negative consequences. Positive reinforcement can also be used during classical conditioning to improve the way a dog feels about a particular stimulus or event. During positive reinforcement, it can be difficult not to also use negative punishment as a reward may sometimes be withheld until the correct response is performed. This may cause stress and frustration in some dogs and therefore it is important to set dogs up to succeed with lots of ‘easy wins’ during training if you wish to avoid this. All of these four types of training work to change behaviour in both humans and animals if applied effectively. However, it is also important to consider how these methods affect the dog’s emotional wellbeing and how they may impact on longer term training goals. If you think about how each of these methods would make you feel if used on you then you can quickly assess what it might be like for your dog during training. It is a bit technical, however, if you can learn these concepts you will be able to assess for yourself what techniques your dog trainer is using and whether this is right for you and your dog. Tamsin is a qualified animal behaviourist having obtained an MSc in Clinical Animal Behaviour from Lincoln University in 2013. In 2017 Tamsin started running Puppy School classes in Solihull, having received tutor training from renowned author, dog trainer and canine behaviourist Gwen Bailey. Prior to running Puppy School Solihull Tamsin spent over two years working at Dog’s Trust gaining valuable experience in caring for and training a wide variety of rescue dogs. In 2014 Tamsin and her husband adopted their own rescue dog, Milo, with whom Tamsin has worked successfully to reduce his reactivity towards other dogs. 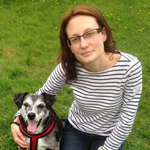 In addition to dog training, Tamsin enjoys writing articles and resources on the topic of dog behaviour for both professionals and dog owners.